I’ve received the last circle journal for this cycle. The next journal that arrives in my post box will be mine coming back to me. The title of this journal is Show Me Your True Colours. The description that goes with it is “I love how black and white backgrounds make every colour pop, by highlighting and reflecting the true essence of all the other colours in the spectrum. Please show me your favourite True Colours”. To make this card, start with a piece of whisper white card stock. 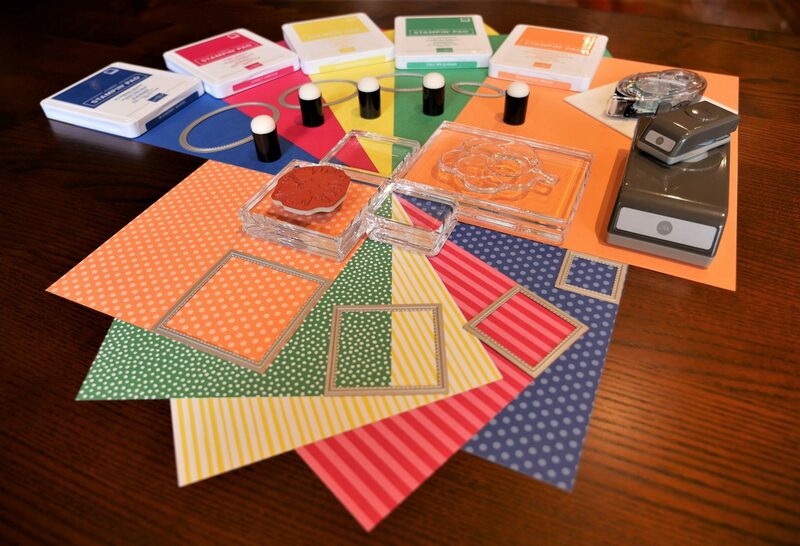 Using your ink pad and a sponge dauber, put dots of your first colour onto the card. I used Grapefruit Grove. Lastly fill in all the white gaps with your third colour. Mine was Coastal Cabana. Once your cardstock is completely coloured, stamp your design onto it with Versamark ink and heat emboss with clear embossing powder. Pick up black Momento ink on your sponge dauber, and rub it over the complete card covering it completely. The ink won’t stick to the clear embossing, and the colours will pop through the back. Once it is completely covered, take a tissue and gently rub it over the card to buff the extra ink off the embossing. I heat embossed the sentiment with white embossing powder, and I feel like my finished card ticks all the boxes for this journal.